Officials of Santa Monica and Ocean Park are fighting a lawsuit that seeks to block the discharge of raw sewage into the ocean. According to testimony, the outfall pipe sags so badly that it isn’t always cleared and as a result, sewage molders in the pipeline, a problem aggravated by warm summer temperatures. Judge Bordwell, however, ruled that he was unable to render a specific decision because the case was improperly presented. Bordwell ordered Santa Monica and Ocean Park to find a way to ease the situation within 15 days. “It is, and has been for a long time, a miserable mess, but the court will render judgment which will probably very speedily overcome the difficulties. It will be necessary for the officials of Santa Monica and Ocean Park to take such steps as are necessary to abate the nuisance or they may find themselves under judgment of contempt for failure to do so,” Bordwell said. In September, residents of Ocean Park and Santa Monica approved a $150,000 ($3,078,535.54 USD 2005) bond issue to build a septic tank and wharf at the foot of Colorado Boulevard for disposal of sewage. 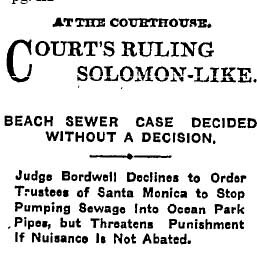 This entry was posted in 1907, Crime and Courts, Environment, LAPD and tagged #Santa Monica, 1907, Environment, Ocean Park, sewage. Bookmark the permalink.